With motorcycle headsets like the Klein Electronics Inc. Motorcycle Helmet Headset, long gone are the days of planning for the trip ahead of time and setting up those signals that the passenger will use to let the driver know that they could stand a stop at the rest area. Going too are the days of everyone in the caravan having to follow a single leader or find a way to communicate the need to stop, give the legs some rest and maybe even to grab a bite to eat. With motorcycle headsets and microphones like the Pryme Radio Products SPM-800F Medium Duty In-Helmet Microphone for use with Motorola Radios, riders will find that they are in a better position to communicate with one another. With motorcycle headsets hooked up to a communication system and worn within the rider's helmet, it's possible for those on the bikes to talk with one another as if they were riding together in a car. Sure, it's possible to communicate without motorcycle headsets, but it is far more efficient when everyone is able to connect and to talk about the key points of the ride, to share a joke or to make a comment about something that they've seen along the way. Rather than hoping that you remember what you were going to say and rather than struggling to communicate, with motorcycle headsets like the Klein Electronics Inc. Ghost Lite Bone Conduction Earpiece the ride will end up being far more enjoyable for everyone involved. 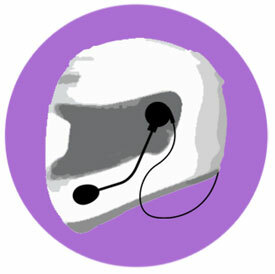 Shop for motorcycle headsets today at www.TWAcomm.com!